HAIDA aluminum composite panel is made up of three layers. The top and bottom layers are composed of aluminium skin. The core layer is sandwiched between the top and bottom, and it is made from non-toxic polyethylene material. This aluminum composite material is completely environmental friendly. Firstly, it contains no toxic substances, and then our composite panel is recyclable. Both the core material and aluminum cover sheets can be re-melted and used for production of new materials. By utilizing superior Polyester coating or Kynar500 PVDF coating containing 70% Polyvinylidene Difluoride, HAIDA standard aluminum composite panel has advantages of high durability and flexibility, high impact strength, and good resistance to chemical, humidity, mortar, salt fog, graffiti and alkaline, etc., and it also have excellent color and gloss retention. HAIDA ACP and its affiliated products commonly have the following composition. 3) Panel Length: 2440mm (standard), and the ACP length is customizable. 6) Non-standard sizes and special colors are available depending on customers' offers. Designed with a wide range of colors, our aluminum composite panels are applicable for building decoration and protections, advertising board making, and so on. 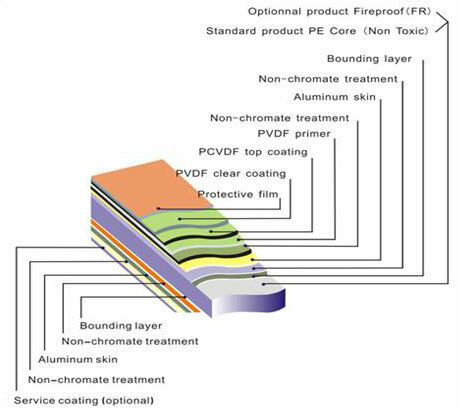 The following details the applications of our aluminum composite materials. 3) Indoors decoration for interior walls, ceilings, bathrooms, hoarding, wall lining, etc. 4) We have advertising aluminum composite panel especially designed for making advertisement board, display platforms, lighting box, and signboards, etc. 5) Sign making, photo frame making, shop design, etc. 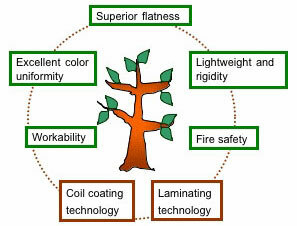 HAIDA aluminum composite panels have the following common features that stem from our coating and laminating technology. The panel surface features superior flatness and high rigidity. Our ACM features great color uniformity and has smooth coatings. Our aluminium composite panel features excellent corrosion and weather resistance. Lighter than solid metals but without compromise of rigidity. Our fire resistant aluminum composite panel is composed of fire resisting core material, so it is fire safe. HAIDA composite material can be easily processed with ordinary machines and tools. Owing to over 10 years aluminum composite panel manufacturing and marketing experience, Litai Ornamental Materials Company has become one of the leading manufacturers of building ACP, advertising ACP and FEVE ACP, located in China. Due to high quality and reasonable prices, our products are well received by customers from America, Britain, Canada, Spain, Holland, Brazil, Mexico, and India, to name a few. If you have any need, please don't hesitate to contact us. We will try our best to satisfy each of your needs.